Clout is a new crypto project that aims to solve the problem of content creation and curation simultaneously for communities where knowledge and expertise are crucial. Not surprisingly, Clout is initially targeting the crypto communities where knowledge is a premium as not many people understand all the intricacies of investing, trading, and understanding of these crypto tokens. Clout aims to become the default gateway for crypto content where both creators and curators are rewarded for their work and accuracy. Clout will share the advertising rewards with the content creators, instead of keeping the rewards to itself like other platforms do (I am looking at your Facebook). As a platform, Clout is created to be similar to familiar platforms like Facebook where users login and post content, interact with the content, create content and curate content. However, the big difference is that Clout is community driven not just in content creation but also in reward distribution for that content. This incentivizes people to participate and create useful and quality content, so it grows both the platform overall and their own revenue. We’ve seen this model succeed with the likes of Steem for example. Clout aims to become the ‘homepage’ for crpto investors, traders, and enthusiasts. We at Crypto Sailor know and understand the challenges of keeping up with the massive deluge of information and misinformation in the crypto landscape every single day. We see the need for a product like Clout for the community. 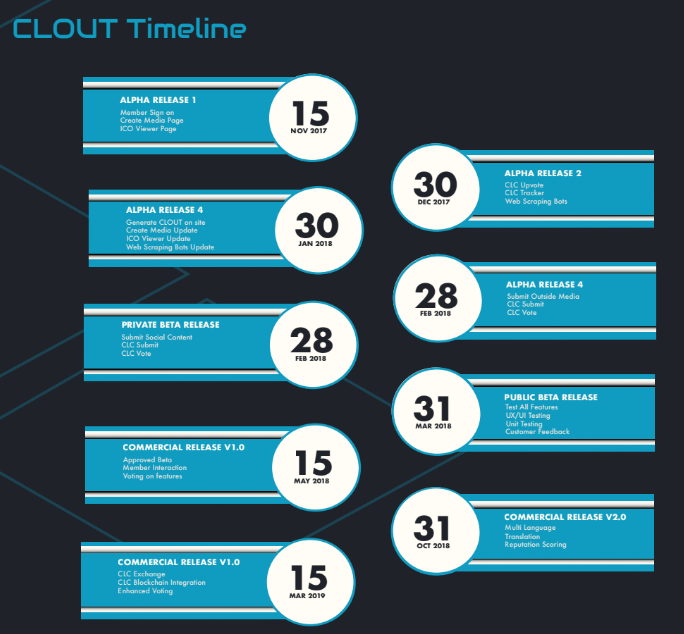 The team has a development plan stretching over a year that you can find in their whitepaper. When the platform is developed and if the team’s vision becomes a reality, it would be a huge boon for everyone in the crypto space be it short term trades or long term investors. After all, the basis of all investment and especially crypto is knowledge and information that not many people have or are able to work hard to gather. Now, if people are incentivized to share their knowledge and expertise with others, that’s a huge win for traders who look for any small edge and advantage over others while trading crypto. The Clout team also aims to provide insightful analysis as part of their content play to the platform participants. Again, there is no right or wrong answer (no one has a crystal ball), but there is a right way and a wrong way to analyze the markets. The hope is, the traders who derive value out of good analysis will see that reward the creators. So now the creators have a way not only to trade the markets themselves, but also share their knowledge with their fellow crypto traders. All of a sudden, Clout has turned a competitive market into a cooperative one.